December supplier payments are out and Christmas clearly was a season to be merry. Capita billed £18,264,588.36 in December on both the Re and CSG contracts. That brings their running total for the financial year to £61.26 million, £10 million more than the whole of 2014/15 and a total of £168.3 million since the start of the contract two and a half years ago. While certain Councillors keep repeating the mantra "Capita are saving money" I keep asking them to show me the evidence because the amount of money we are paying seems immense compared to the core contract value. Our friends Comensura were also paid £1.58 million in December bringing the total this financial year to date to £13.8 million for agency and interim staff. This remains a contract out of control although I note that they have not asked for an advance payment this year to cover the Christmas period. There are a couple of other anomalies in the payments. The first is for a large amount of money £640,640 which was paid to the Accountant General of the Senior Court. I wonder what this is for? I am grateful to the FOI department at Barnet Council for a very speedy and complete response. This sum is for the Compulsory Purchase of a derelict property in NW4, so whilst it is a large payment out it is now an asset of the council. Zoopla suggests that the value of the properties either side are valued at just over £1 million so let's hope this property generates a return on investment for the council. The second payment was a much more modest amount of £1,552.11 on 15 December and was for "Equipment and Material Purchases" by the Assurance Department. Nothing strange about that you may say other than the supplier name - Haven Bistro & Bar, the very pleasant restaurant in Whetstone. You will not be surprised that I have already submitted an FOI request for the invoice. I hope this isn't a repeat of the erroneous invoice for "training" which was carried out at the Claddagh Ring pub which I blogged about here . As always I will keep a watch on spending in Barnet. At last week's Performance and Contract Monitoring Committee the main topic was the performance and review of the Capita Customer Service Group contract. Mrs Angry has written, as usual, an exceptionally readable, far superior and incisive review of the meeting which you can read here. I had a number of questions for the Chairman. A link to the questions and responses are here but the nub of my concern was most usefully raised by Cllr John Marshall when he asked if I would agree that the Capita contract has saved Barnet money. The core contract does save money, although I'm not sure if it as much as was originally envisaged simply because a number of items were overlooked when the contract was being drafted and services were omitted. Most recently we were told that we would have to pay an extra £565,000 per annum for a contract for IT systems for Revenue & Benefits "because the contract was transferred with no budget". I would also note that if Barnet had put as much investment into the in-house team, they too might have delivered comparable savings. So whether Capita has really outperformed what the in house team might have delivered will never be known because, of course, the in house team were expressly precluded from the tender process. However, the area where we seem to be paying a fortune to Capita is in all the extras including all the special projects and share of savings. At this meeting an officer did concede, when I put one of my supplementary questions, that some of the work charged for as special projects would previously have been carried out by salaried council staff. Capita charge for all these projects at consultancy rates and they are costing millions. Councillor Hugh Rayner actually had the measure of this before the contract was signed. Thanks to Barnet Bugle who filmed the meeting back in October 2012 - but where were you last week? Cllr Rayner hits the nail on the head when talking about how to make more money out of contracts. 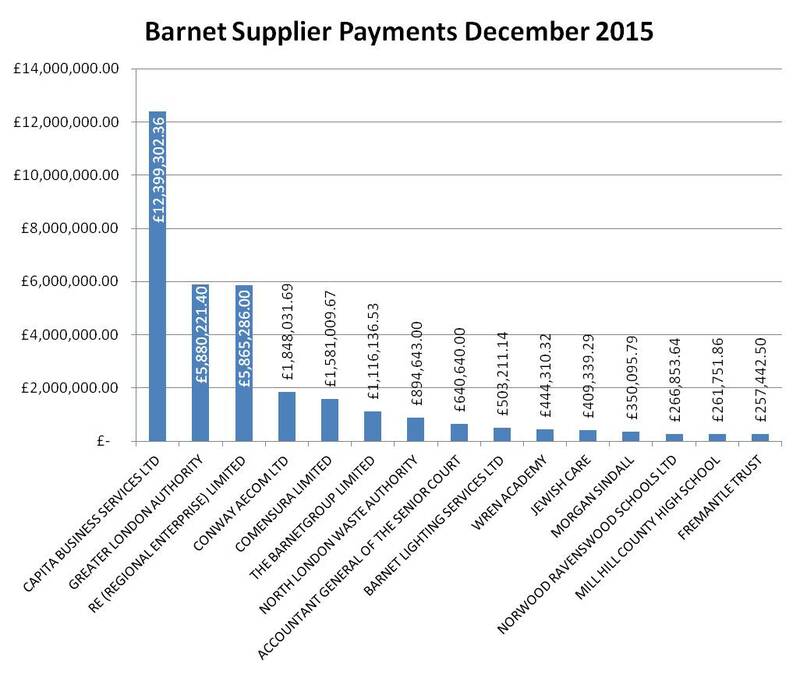 If you look at Barnet Council accounts, how much they spent in 2014/15 compared to 2013/14 they seem to have spent more even though there have been massive cuts to services. So my question to Cllr Marshall and to every other Cllr is show me the evidence - have you actually realised these mythical savings. Just repeating the phrase "we have made savings" doesn't make them happen. Someone needs to get a grip of all the money being spent on extras, on costs like the Comensura contract for interim staff which is massively overspent (Capita are responsible for HR so why haven't they come up with a strategy to reduce agency staff - but they benefit from the overspend through their gainshare payment) and start actively managing this contract. The three year review process of the Capita contract is about to start and it already looks like a stitch up. Officers will carry out the dialogue with Capita reporting back to Cllrs and meetings will be held in private. Cllr Geof Cooke did ask for the meetings to be held in public but Cllr Finn as Chairman of the committee refused. He said maybe one or two but we all know what that means. Put to the vote all of the Conservative Cllrs voted against Cllr Cooke's amendment and yet again some of the most important discussions about a contract costing hundred's of million of pounds will be held behind closed doors. Personally I don't think Cllrs stand a cat's chance in hell of ever getting to grips with the contract without a great deal of professional support and as such it will be a missed opportunity - yet again. I suggested to Cllrs that they should appoint someone to help them with their review, someone with detailed contractual and accounting experience who can guide and advise them. No, came back the response we have officer for that. Yes and are those the same officer that wrote a glowing review of Capita's staff and data centre, "OUR data centre" as Cllr Cooke pointed out which of course in Capita's data centre made officer's look rather silly and cast serious doubt over who authored the report. Trust, Evidence, Scrutiny; all in short supply in Barnet.